The Folder category features multiple Actions that can perform a variety of most needed automatic operations with folders. Automation Workshop can automatically create folders, copy folders, move folders to another location, rename folders, delete folders and erase folder content. Typically on computer systems files are organized in folders which can contain many levels of subfolders. Automation Workshop can automatically perform various operations on folders, allowing to organize data storage, create simple backups on the local machine or remote network drives. Without a line of code You can automate operations with folders. Folder Actions support Unicode in folder names and can process folders in any language. Folder processing is very fast and only limited by disk speeds. All folder Actions work both with local and network drives. 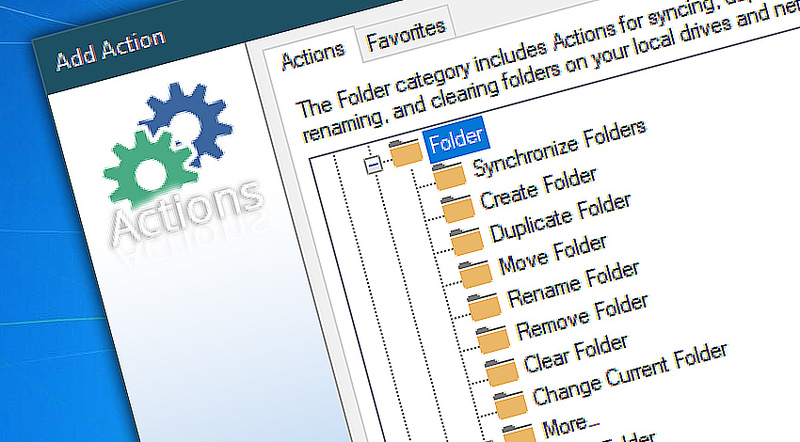 Folder Actions work well together with other Automation Workshop Triggers and Actions. E.g., You can use File / Folder Watcher to monitor for changes in folder contents, such as new, modified or renamed files or folders. When anticipated change happens, Trigger can pass the relevant data to Folder Actions that in turn takes care of the rest. Folder Actions can also report its outcomes and parameters to other Actions within the Task that can show it in a popup window, send in email, save on disk or run another automated process. Create folder makes a new directory at specified path. Create folders automatically to organize your files, folders and data workflows in convenient and manageable way. Duplicate folder automatically copies the folder contents to destination folder. During duplication process the folder contents are copied from source path to destination location. Move folder automatically moves folder or folder contents from source folder to destination. Rename folder changes the name of specified folder. Automatically rename folders to make them conform to their changed role, new situation or naming convention. Remove folder automatically deletes the specified folder. Automatically delete folders with their contents when they become no longer necessary. Clear folder empties the contents of specified folder, and erases everything, including read-only files and folders. Change current folder sets a new default folder. The following Actions are executed in this default folder (e.g., regarding files in default folder) unless explicitly specified otherwise. File / Folder Actions contain a variety of essential tools for creating automated workflows that can perform most file and folder operations. Create folder · create folder automatically for easier file management. Duplicate folder · create an exact copy in the specified location. Move folder · move folder from source to destination folder. Rename folder · automatically rename folders when necessary. Remove folder · automatically delete folders with all their contents. Clear folder · deletes all files and directories in specified folder. Change current folder · specify default folder used by all Actions.